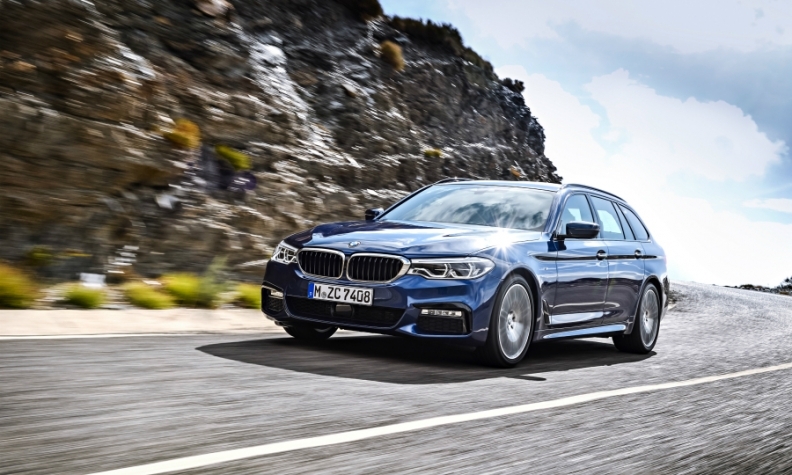 BMW has unveiled the latest version of its 5-series Touring model in Geneva. GENEVA -- BMW Group innovations on display at the Geneva auto show this week include a wagon version of the long-running 5 series and the 4-series coupe with an upgraded interior -- hardly the stuff to make a car lover swoon. Yet the emphasis on its popular models instead of flashy new vehicles underscores the strategy of CEO Harald Krueger, who's focusing on generating cash instead of buzz as the luxury carmaker gears up for the costly shift to electric and self-driving cars. "We're transforming BMW from a carmaker into a tech company and a mobility-service provider," Krueger said in response to questions from Bloomberg. "During this transformation, there's one constant factor: a rigorous focus on what helps our customers and what they desire." His low-key approach contrasts with that of his predecessor, Norbert Reithofer, who pushed the automaker into pioneering the i3 and i8 electric cars earlier this decade, only to see demand disappoint. It's also at odds with BMW's bigger German competitors, Volkswagen Group and Mercedes-Benz parent Daimler, which have both rolled out aggressive plans for developing battery-powered models. BMW's missing wow factor at the Geneva show, often a venue for showcasing the glitziest cars, extends a lull for the automaker. The flagship 7-series sedan spurred tepid demand after its 2015 redesign, while a revamped 5 series, unveiled last year, was hardly distinguishable from its predecessor. BMW seemed much more aggressive as recently as 2014, when it rolled out the futuristic i8. The two-seater sports car combined a 3-cylinder gasoline engine with plug-in hybrid technology in a light-weight body made of carbon fiber that was mass produced at a special facility in Washington state. All carmakers are currently facing the pressure to invest in expensive new technologies with a questionable payoff. Consumers have thus far balked at battery-powered models because of costs and charging concerns, and it's unclear whether customers will pay for automated-driving and connected-car features. While electric-vehicle deliveries are set to increase, they're likely to remain a small fraction of overall demand for years to come. IHS Automotive forecasts sales of battery-powered and plug-in hybrid vehicles will reach 7.7 million by 2025, about 8 percent of the current car market. Even with its conservative approach, BMW in November warned profitability will be squeezed by spending on technology, as its profit margin from automaking narrowed to 8.5 percent during the third quarter from 9.1 percent. That means keeping earnings from eroding further has greater priority than the annual sales race, which BMW lost last year to Mercedes for the first time in a decade. Rather than rush to produce more all-electric vehicles, BMW is instead adding batteries and electric motors to existing models and continuing an emphasis on lucrative cars and SUVs with conventional engines. Still, competitors aren't easing up. Daimler plans to increase annual research-and-development spending to about 8.1 billion euros ($8.6 billion) -- 22 percent more than the 2015 level -- amid plans for at least 10 battery-powered models under the Mercedes EQ brand. Volkswagen has pledged a 30-model line-up of all-electric cars by then. And Tesla is ramping up production of its $35,000 Model 3 and plans to reach output of about 5,000 units a week by the end of the year. "The danger is that these new vehicles like Mercedes' EQ and Volkswagen's I.D. are a huge success, leaving BMW wrong-footed," said Harald Hendrikse, a London-based analyst with Morgan Stanley. "The push for electric cars does feel more real this time." Krueger, who took over in 2015, likes to say that making electric cars is a marathon, not a sprint. He paused plans to add costlier 'i' cars until 2021, when BMW is set to unveil the electric and self-driving iNext. A suite of automated models is set to follow, he said. In the meantime, the focus is on adding electric variants of mainstays like a battery-powered Mini and BMW X3 SUV. "In future, we're betting on maximum flexibility and scalability so as to bring electric mobility to a new and unprecedented level," said Krueger. To explain his strategy internally, the CEO had a temporary building roughly as big as seven basketball courts erected in Maisach, the site of an old airport and now a BMW driving academy near Munich. Over a three-month period through March, the company will funnel some 14,000 managers through workshops where engineers explain electric powertrains and software specialists demonstrate new services in connected cars. The last time BMW summoned its leadership for such a boot camp was in 2008, after green-lighting several initiatives including the project that created the innovative i3 electric-powered city car. "BMW's decision to go for a gradual approach feels like the safer one in terms of investment outlay," said Hendrikse. "There's no evidence to suggest people need a special-looking electric car and won't buy a 3 series with a good battery range."